Noname, aka Fatimah Warner, is the embodiment of Black Girl Magic. A seasoned slam poet turned rapper from Chicago, she oozes a nonchalant sense of confidence with every word, every gesture and every time she forgets her words and laughs about it. With a conversational flow, she serves up her personal stories on top of uplifting jazz beats that add a bit of air to the gravity of her words. She's a poet by profession, and it shows. 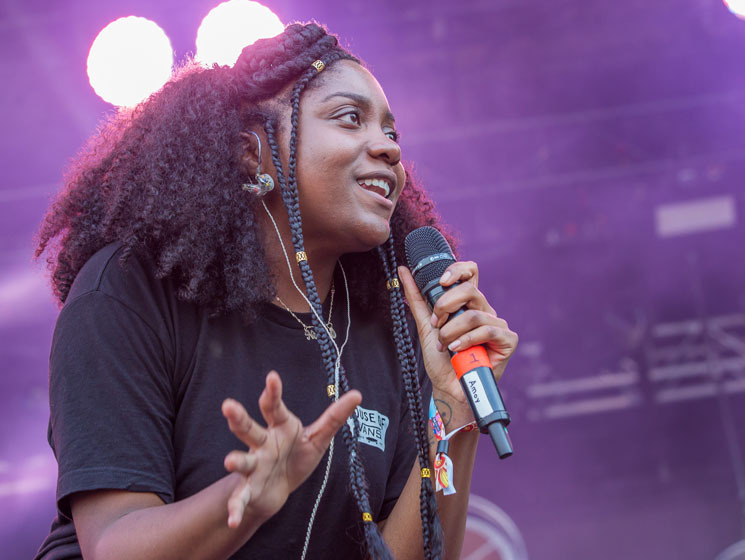 Taking to the stage smiling, dressed in all black with bright yellow Chuck Taylors, Noname launched immediately into tracks off her critically acclaimed release, Telefone, to applause from the modestly sized afternoon crowd. She moved through "Diddy Bop," "Casket Pretty" and "Yesterday" with ease, rapping "check my Twitter page for something holier than black death" to a dancing crowd. Talking to the crowd with the naturalness of a veteran performer, she looked everyone in the eyes, joked with them, and even sat down on the edge of the stage, crossed-legged, while going through tracks she's featured on, like "Amphetamine" by Smino, and the Mick Jenkins' "Comfortable," like a friend chatting with you on the bleachers. Backed by an excellent band, her short set was bouncy — ending with "Shadowman" after three white men in the audience, jumping up and down, yelled it out. "These three are dancing with so much energy," she said, "maybe it's 'cause they're privileged."